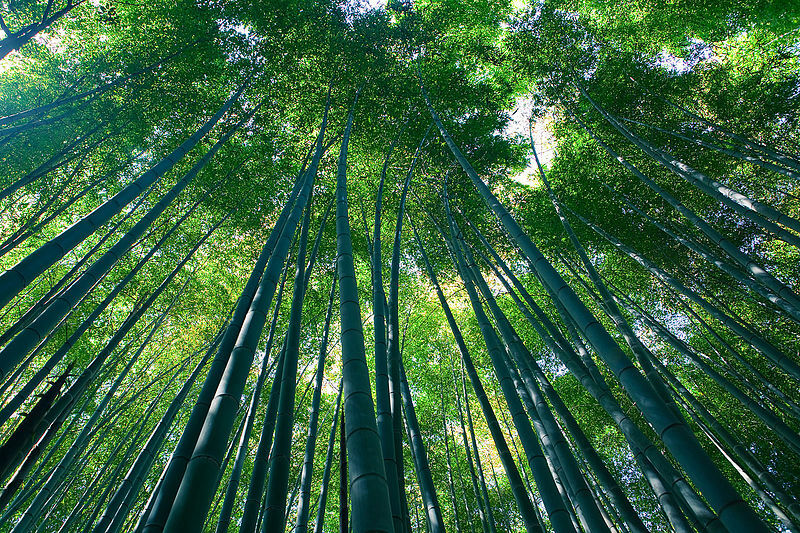 Two works offering to take Wing Chun students through the “Bamboo Curtain.” Source: Sagano Bamboo Forest. Wikimedia. This is the third and final installment of our short series on the earliest printed publications to discuss Wing Chun in English. These books and articles range in date from 1968 to 1976 and are actually some of the oldest published material on the art in any language. Part I of this series, which examines the earliest Black Belt article to discuss Wing Chun (1968), as well as Clausnitzer and Wong’s pioneering volume (Wing-Chun Kung-Fu: Chinese Self-Defense Methods, 1969) can be seen here. The sources discussed in that post are an interesting window onto the nature of the early Wing Chun community before the advent of the “Kung Fu Craze” in the 1970s. Part II of this series focuses on the contributions of James Yimm Lee. His slim green volume Wing Chun Kung-Fu was heavily promoted by Ohara publications and Black Belt Magazine. It even graced the magazine’s cover in late 1972, as Lee himself lay dying of lung cancer. This work took the simplicity and parsimony that had always been part of the Wing Chun system to the next level. Lee’s treatment of the art sought to demystify the subject matter with clear photography and discussions based on training methods rather than history or philosophy. The end result was one of the best-selling works ever published on the Chinese martial arts. While the project had actually been started many years earlier, the release of the book was perfectly timed to exploit the eruption of the Bruce Lee Phenomenon following the release of “Enter the Dragon” in 1973. It was a tragedy that neither James nor Bruce lived to see its ultimate success. In today’s post we will examine the next two introductory works to be published on Wing Chun. 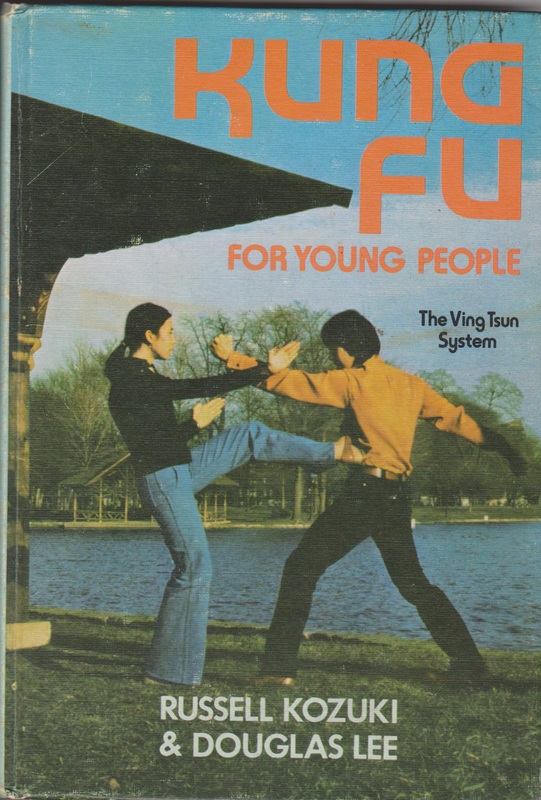 The first of these, released in 1975, was Kung Fu for Young People: the Ving Tsun System. This volume, co-authored by karate expert Russell Kozuki and Moy Yat disciple Douglas Lee (Lee Moy Shan), was published and distributed by the Sterling Publishing Company in New York City. 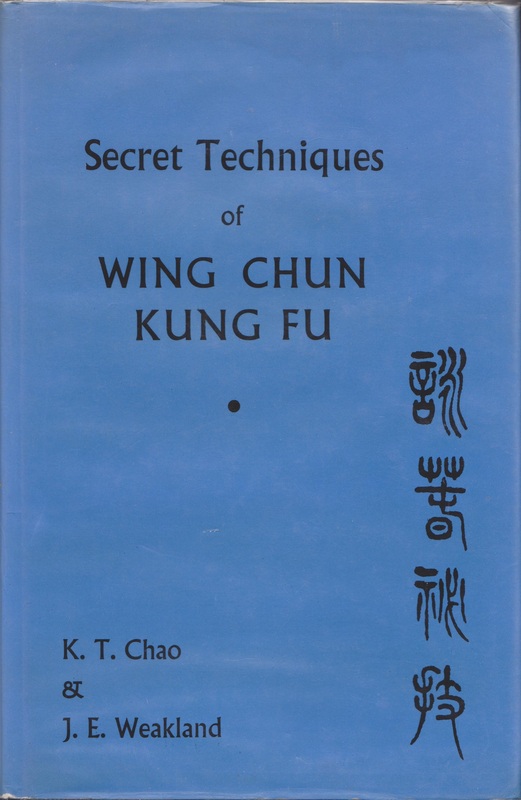 The second work that we will review is titled Secret Techniques of Wing Chun Kung Fu by K. T. Chao and J. E. Weakland. It was published by Paul H. Crompton Ltd of London. Each of these works is clearly a product of the Kung Fu Craze. Both of them make reference to Bruce Lee and martial arts themed television shows and movies in their text. The authors have no doubt as to where their readers are coming from and what their level of experience probably is. Kozuki and Lee even play off of the superficiality of their readers experience. The advertising blurb on the back of their book attempts to create a sense of shame and insecurity in the readers, promising to teach them the real truth behind the myth of the Chinese martial arts. Nor is this promise unique. The works of this last period are characterized by a concerted effort to recast Wing Chun as an esoteric, rather than a rational and modern, practice. In many respects the two books that we will be looking at below are very different. Each has its own goals and quirks. Yet both of them seem to be engaged in a process of myth-building and mystification. Nor are they alone in this. We do not have time to review all of the magazine articles that started to appear after 1973, but this same esoteric turn, with its increased emphasis on ancient philosophy, secret master-disciple relationships and “living the martial way,” is clearly evident in that literature as well. From one perspective this is an unexpected development. The pre-1972 discussions of Wing Chun never mentioned ancient philosophy. Nor was there much discussion of the art as a “way of life,” as opposed to a more efficient method of boxing. Yet after 1973 Bruce Lee becomes the crux of the issue. As we have seen in previous posts, there was a serious disconnect the between Lee’s approach to the martial arts in real life (which was reflected in the spartan utilitarianism of James Yimm Lee’s book) and the image that he projected on the silver screen. That vision of the Chinese martial arts focused on mysterious Shaolin schools, esoteric eastern philosophy and becoming a human weapon capable of fight against oppression with one’s bare hands. This was the aesthetic vision that transfixed audiences, and it followed them into the Karate and Kung Fu schools, which they joined in droves. The strongly entrenched utilitarian ethic in Wing Chun probably insulated the art from at least some of this increasingly romanticized vision of the martial arts. But it is clear that things did change after 1973. Frequent protests to the contrary notwithstanding, martial arts instruction is, and always has been, a buisness. Like any industry the “good” that is produced is informed by the forces of both “supply” and “demand.” And when a giant new customer base shows up demanding esoteric oriental values and practices, at least some supplier will discover that they are willing to produce them. By the 1980s it was clear that Clausnitzer and Wong’s predictions had been vindicated. The simplicity of the Wing Chun system, along with its relative openness, probably did help it to succeed while other Kung Fu systems failed to thrive. Yet the public image of the art, which was increasingly being consumed by competing claims of authenticity based on esoteric or even secret teachings, probably would have surprised the authors. Ultimately this move towards a greater emphasis on lineage and claims of priority spread and succeeded because it filled a need on the part of consumers. What Wing Chun as a fighting system offers is very simple, but what consumers demanded in the wake of the Kung Fu Craze had more to do with complex questions of identity and personal transformation. While this pattern would crystallize and become clearly recognizable in the 1980s, it is interesting to note that the same trends can be seen taking root in 1975 and 1976. Kung Fu For Young People: The Ving Tsun System. Source: Authors personal collection. Following the death of Ip Man, Moy Yat immigrated to New York City and began teaching Wing Chun. In fact, he had been teaching Wing Chun in Hong Kong since the early 1960s and had trained Greco Wong. Another of his students, Lee Moy San (Douglas Lee), had actually moved to New York shortly before his teacher arrived. Lee continued to teach in the area and promote Moy Yat’s Wing Chun organization until he returned to China in 1986. Lee Moy Shan is a fairly widely recognized figure in the Wing Chun community. He taught Darrell Jordan (among others) and has also given a number of interviews over the years outlining his approach to Wing Chun. He was also the coauthor of one of earliest books on Wing Chun written in the English language. Still, Kung Fu for Young People was not a solo effort. It was co-authored by Russell Kozuki (1914-2004), a martial arts writer, teacher and founder of the Nippon Goshindo Kempo System. In addition to Kempo, Kozuki also studied Kodokan Judo and Hakko Ryu Ju-Jutsu. In 1969 he published The Karate Road to Power with the Sterling Publishing Company in New York. This was the same firm that would carry the later work on Wing Chun. Kozuki’s relationship with Sterling appears to have been long and exceptionally fruitful. In 1975 they released Karate Power: The Basic Katas. Later in 1981 Sterling would debut his volume Karate for Young People. In 1983 they published Power Karate. Sterling then published Winning Karate in 1984. I do not know the nature of the preexisting relationship between Lee and Kozuki, but it makes sense that the publisher might want to insure the success of a project like this by relying on a proven source. The 1975 volume on Wing Chun actually lists Kozuki as the primary author. This is really odd. While one sees “blocks” in karate, there are no “blocks” in Wing Chun. Movements like the Tan Sau or Bong Sau (which are discussed at length in this chapter) start off as potential punches that are somehow bridged or redirected. In fact, it is impossible to do a Bong Sau correctly if it does not start out as a punch. The entire discussion is actually a little misleading. I don’t think that anyone who actually teaches Wing Chun would ever introduce the Bong Sau, Pak Sau and Tan Sau before they introduced the basic punch, yet that is exactly what this volume does. I can only think of two possible explanations of this. It is possible that they authors intentionally decided to introduce the “defensive” material first in an attempt to “correct the misconception” that Kung Fu was a dangerous and violent pursuit that might not be well suited to young people. After all, a lot of the media being produced in the middle of the 1970s was popular precisely because of its graphic portrayals of violence. Yet there was also a perception by practitioners that this could limit the growth of the art. As a result attempts to restore a sense of “balance” to the discussion of the martial arts were common in this period. KUNG FU FOR YOUNG PEOPLE: The Ving Tsun System by Russell Kozuki and Douglas Lee ($4.95) is intended to correct the misconception that Kung Fu is a deadly sport. The authors explain that the system is safe and exciting; it stresses speed, inner strength, a healthy mind and body. ( 10-up). Publishers Weekly. Vol. 208 Part 1. 1975. pp. 103. Clearly the enthusiasm of the Kung Fu Craze was double edged sword for those who sought to promote the martial arts. They wished to commodify these fighting systems. Yet at the same time it was necessary to make them safe and appealing to a consumer audience. This was especially important when dealing with readers “Age 10 and up.” The emphasis on “defensive movements” (which is not really a category that exists in Wing Chun) might make sense in that context. Of course the other possibility that is that Kozuki may have been crafting the discussion that emerged based on his prior experience writing on Karate. Kung Fu became popular in martial arts circles among the same group of people who were interested in Karate. Both of these striking systems were perceived as a more vigorous alternative to judo and other grappling systems. In various Karate and Tae Kwon Do systems blocks are purposive actions. An extensive background in those systems might color how one perceives and discusses Wing Chun as well. The volume then proceeds with a discussion of punching, kicking and the history of Kung Fu. One of the most remarkable things about this book is the photography. While not particularly clear most of the photos feature female Wing Chun students. 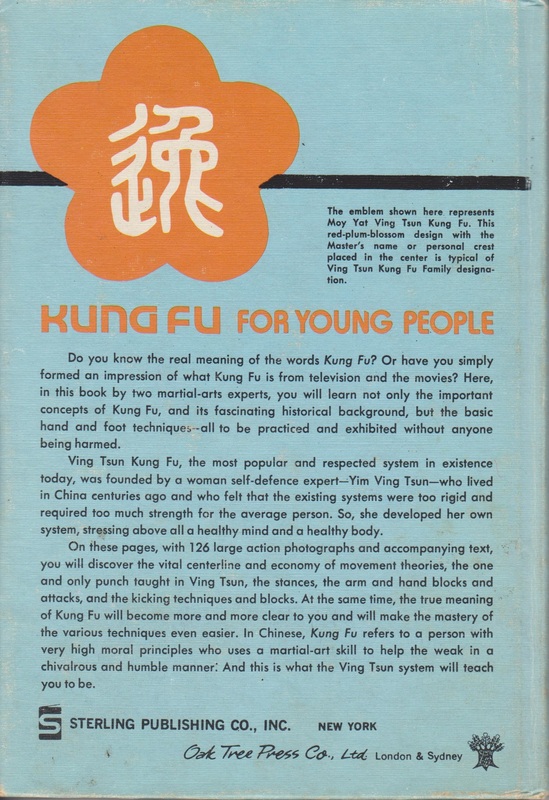 Even the cover of the book shows a woman in bell bottoms using her Kung Fu against a male opponent in a self-defense situation. All of the works that we have previously discussed related the story of Yim Wing Chun and noted that her system was thought to be good for female practitioners. Yet after that they simply retreated into the world of the male dominated studio and showed only men demonstrating Wing Chun’s essential techniques. So far as I am aware, this is the very first major publication from the era to forcefully make the argument that women both could and did study Wing Chun, and then to back that up with their photography. Still, for the most part this brief work (127 pages) is most remarkable for what is not there. I found it fascinating that while the authors treated the topic of Wing Chun’s history twice, and even claimed that monks and nuns were central to the development of Kung Fu, they never once mentioned the art’s association with the Shaolin Temple. Even Ng Moy’s Shaolin roots went unmentioned. Secondly, this work features a number of somewhat random self-defense techniques drawing from all three unarmed forms (and possibly some dummy material) but there is nothing really useful to a beginning student in here. For instance, there is no discussion of Siu Lim Tao or a list of the basic movements that students will encounter therein. While countless new Wing Chun students have been able to buy James Yimm Lee’s book and use it as a primer or prompter when learning their basic material, it would be impossible to use this book in the same way. Wing Chun is a concept based art. Yet besides a few basic drills (pauk punch ect. ), what this book offers are examples of set piece defenses. Again, this is hard to understand as Wing Chun explicitly eschews this approach to the combat. So if it does not seek to systematically introduce basic skills or fundamental concepts (other than those already published by James Yimm Lee) what is the real purpose of this work? The answer seems to be advertising. When looking over the basic structure of this work it might seem strange to readers that the authors would save the discussion of Wing Chun’s history for the final two pages of the book. In most treatments history is placed right at the beginning. However its position at the end of the volume allows the author to seamlessly transition into his sales pitch. “At present, the New York City area is blessed with the presence of Master Moy Yat, a prominent instructor in the Ving Tsun Kung Fu “family” and a close disciple of the late Grand Master Ip Man. The responsibility of bringing Ving Tsun to the rest of the United States and consequently to the rest of the western world depends on Master Moy Yet.” pp. 126. It goes without saying that this view of the Wing Chun community is not entirely correct. There were actually a number of other Wing Chun instructors (all Ip Man students) who were active in the US by 1975. I believe that Duncan Leung was even teaching in New York City as these words were penned. And of course there were also a number of other instructors in places like the UK and Australia. In short the authors and publishers have just successfully cooperated in convincing readers to spend $4.95 on what was essentially an elaborate advertisement. It allowed the Sterling Publishing Company to benefit from the growing enthusiasm around Kung Fu at little expense, while the Moy Yat clan was able to use the book in an attempt to get out in front of the “Bruce Lee phenomenon” and claim the growing market for Wing Chun as their own. It is hard to imagine that a book like this could have been published prior to 1973. Western martial artists with an extensive background in Judo or Karate would have very quickly noticed what was missing from such a work. Further, Wing Chun was an obscure enough topic that it wasn’t really worth anyone’s time and effort to try and set themselves up as the “grand master” of the system. After 1973 that all changes. We have already seen Leung Ting claim to be Ip Man’s successor in the pages of Black Belt. Now we have Moy Yat attempting to monopolize instruction in North America and Europe. Secret Techniques of Wing Chun Kung Fu. Hardbound 1st edition. Source: Author’s Personal Collection. It is interesting to contrast Lee Moy Shan’s work with that by James Yimm Lee. Where Lee studiously avoided any discussion that might distract from the technical execution of the art, Lee seems to have embraced the notion that Kung Fu was as much a way of life as anything else. Moy Yat himself was a proponent of similar ideas. Still, in order to use Wing Chun as a metaphor it must be generalized to fit a variety of unrelated situations. That is simply the nature of the exercise, and it always comes at the expense of a certain “conceptual fuzziness.” Still, I suspect that this is an accurate reflection of what many martial arts students were demanding in the middle of the 1970s. A similar trend can be seen in what is otherwise a very different book. In 1976 K. T. Chao and J. E. Weakland released Secret Techniques of Wing Chun Kung Fu, Volume 1. (Paul H. Crompton LTD, London). The preface of this book begins by decrying the rapid rise of popular interest in Wing Chun. In the opinion of the authors this has led to a number of recent books and articles that neglect the principals and concepts of Ip Man. They seek to remedy the situation by revealing the “secret techniques” that lay behind Wing Chun through both conceptual analysis and a series of two man drills and exercises. While brief the preface of this book raises a number of important questions. To begin with, Ip Man loudly and repeatedly claimed that he had no “secret techniques.” That was the entire point of his reformed teaching system in the Hong Kong period. Thus it is sort of ironic to hear one of Ip Man’s direct private students offering to reveal the very secrets that his teacher claimed did not exist. In point of fact there is actually nothing in the book the vast majority of experienced Wing Chun practitioners will have not seen before. The material that the authors offered in this volume is good solid stuff, but it is also pretty widespread throughout the Ip Man clan. Of course this will not be the last time that a Wing Chun student will seek to advance a project through the claim of secret esoteric knowledge. Secondly, one wonders exactly which books the authors are condemning. It is certainly true that many of the magazine articles that were published in the 1970s were of uneven quality. But only a hand full of books on Wing Chun had ever been released. In fact only three works (excluding Moy Yat’s specialized monograph on the dummy) had been released to that point. The first of these by Clausnitzer and Wong (1969) was of surprisingly good quality (especially given its early date). The second by James Yimm Lee (1972) has proved to have real staying power in the market. And it seems unlikely that Chao and Weakland would have been aware of Kozuki and Lee’s 1975 volume when they were preparing their own manuscript for publication. No other books on Wing Chun had yet been published in the English language. One suspects that these lines could have been a rhetorical flourish rather than a serious critique of the existing literature. It may simply have been another way to add value to the more systematic vision of the art and Chao and Weakland were about to reveal. Still, there is a real possibility that Chao objected to the stripped down version of Wing Chun, devoid of most its Chinese cultural reference points, which had been promoted by Bruce Lee prior to the creation of Jeet Kune Do and James Yimm Lee in his 1972 volume. Whatever their differences, there does seem to be one topic that the present authors and James Yimm Lee agreed upon. The point of a book on Kung Fu is to teach the style, or at least assist in that process. Neither author saw their book primarily as an advertisement for the art or an attempt to promote a specific school or lineage. Weakland and Chao never seem to have been active public martial arts instructors. As such they didn’t really need “advertising” in the same way that Moy Yat did. Chao studied Wing Chun from childhood and then went on to receive law degrees from Universities in both Taiwan and the UK. Weakland spent most of his career as a historian at Ball State University in Indiana. Many of his publications deal with medieval and renaissance Europe, with an emphasis on Catholic history. Both of these individuals had successful careers outside of the martial arts. In the “About the Book” section the authors note that the scope of the demand for instruction in Wing Chun is quickly outstripping the number of qualified instructors trained by Ip Man who are currently in the west. While they pay lip service to the idea that it is impossible to learn the martial arts without a skilled teacher, it quickly becomes evident that this is exactly what their book is meant to do. The entire text is structured around the Siu Lim Tao form. It breaks the form down into its component movements and structures an entire teaching curriculum around these pieces. In each case an individual movement is introduced, a series of two man drills are provided and these self-defense applications are introduced. At the end of the work the complete form is introduced, which students can now practice with a fair degree of understanding. It is very difficult for most people to learn anything without a teacher. Still, if I was forced to outline a program for self-instruction it would be something very similar to what Chao and Weakland provided in this book. If one had a group of friends with which to study this material, and you actually went through the outlined drills and exercises regularly, it would be possible to grasp some of the basic ideas behind the Wing Chun system. Of course the real problem facing potential students in the late 1970s and early 1980s was not the complete absence of experts, but rather the challenge was finding regular instruction. Many people who did not have a local instructor could still make it to the city for occasional training or a two day seminar a few times a year. Even this would be a real advantage as it would allow students to feel the different energies for themselves. They could then return to their small study groups with their notes, Chao and Weakland’s book and the hopes of actually making some progress. I suspect that this is exactly how Wing Chun managed to spread itself so quickly in North America during the early 1980s. While regular instruction was still somewhat hard to find there were enough materials on the market that at least some individuals were able to engage in a successful campaign of self-instruction. Chao and Weakland would have been an exceptional resource in another sense. By providing a ready-made curriculum for drilling basic skills, teaching Siu Lim Tao and introducing its self-defense application, they probably helped a lot of “less experienced” instructors set up shop. Given that their book starts off with a warning of the dangers of the insufficiently trained teachers I am not sure what the authors would think about that. Still, I suspect that this book was actually a critical resource for many new Wing Chun students and Kung Fu teachers alike in the late 1970s and early 1980s. While the authors offer the most detailed of our early works on Wing Chun, it is not without its problems. These start in the section titled “History.” Given that Weakland was a professional historian (indeed he was the first professional academic of any type to write on Wing Chun) one would have expected something really special. He should have known all about the importance of reliable sources or, baring that, simply getting decent translations of some of Tang Hao’s books on the history of Shaolin Kung Fu from the library in Taiwan where his co-author got his law degree. Instead Weakland appears to have relied on the oral folklore of both martial artists and gangsters to investigate the origins of Wing Chun. Of course he was not unique in this. The redoubtable R. W. Smith basically did the same thing with his short volume on Shaolin Kung Fu. Both men (otherwise fine scholars) seem to have accepted without question that the Chinese martial arts were passed on only through oral culture. As such those legends had to be given primacy. In reality this is not at all the case. The martial arts did leave behind a written record and historians can look into these questions. Still, this is an important reminder of how pervasive the theory of their exclusively “oral nature” was, and the progress that has subsequently been made in the area of Chinese martial studies. For me the most interesting material in the book is found on pages 2-5. Here the authors recount their own version of the Wing Chun maxims. These are statements that convey some essential concept of the art. Traditionally they were used as aids to memory and teaching. For instance “the Wing Hand (Bong Sao) is either the best or worst of movements” is a commonly known axiom still heard in schools today. This is the earliest publication of these maxims that I have been able to locate. While undoubtedly good advice, neither of these additional rules really reflect the original themes of the Jo Fen. It has more to do more with social relationships than personal psychology. They also show that the authors are not providing a straight translation of their prior Wing Chun experience; rather they are interpreting and editorializing on the system. It is important to note that there is no evidence of Wing Chun having any sort of connection to Daoism in Foshan or Hong Kong, but you would not get that impression through reading this book. The mythology of the system explicitly links it to Buddhism, but that influence is pretty much absent from most lineages of the system as well. If Ip Man himself was influenced by any traditional philosophy it was probably Confucianism. Yet the authors of this book seem to be more interested in Daoism, and finding applications for Daoist theory, than one might expect. The Zhuangzhi is quoted in a number of places in an attempt to situate core Wing Chun concepts. The introduction also features a lengthy discussion of the Ying Yang symbol that contrasts nicely with the one offered by James Yimm Lee. While Lee attempts to understand Wing Chun in the abstract, standing apart from any particular system of meaning, Chao and Weakland seem to argue that it can only be understood within the context of traditional Chinese culture. If their book has any “secret” to offer its probably this. Overall this is a very useful book. The photography is a little overexposed, making some of the illustrations less clear than they could be. The authors also attempted to introduce their own English language terminology for the movements, much of which failed to catch on. Still, the technical discussions in this book (and the two other volumes that followed it) are excellent. While less well known than Lee, these are still valuable reference works as well as important historical sources. Kung Fu For Young People, Verso. Source: Author’s Personal Collection. Our survey of the early English language publications on Wing Chun has made it clear the art experienced rapid growth between the middle of the 1960s and the mid 1970s. Not only did the number of students increase, but their goals and background changed dramatically. Early works such as those by Clausnitzer and Wong were aimed at a relatively small audience of experienced martial artists. These individuals were motivated by the trends within the martial arts community. For instance, they were often investigating Kung Fu because it had been advertised as a “striking arts” and as a possible alternative to Judo. While we usually date the start of the “Kung Fu Craze” to 1973, a careful survey of these works shows that the Chinese martial arts had been steadily gaining popularity within martial arts circles since at least the middle of the 1960s. Latter works, such as that by Kozuki and Lee sought to capture a much larger audience whose only exposure to the martial arts was through the media. These consumers and potential students appear to have placed more weight on issues of culture, identity and personal transformation than the striking vs. grappling debate. Of course this is also exactly what the martial arts of the small and large screen promised them. While Bruce Lee opened the doorway for a vast number of new martial arts students, he was also responsible for altering the way in which many of these styles, including Wing Chun, were discussed and viewed by the public. This focused examination of the major Wing Chun publication from 1968-1976 has revealed some critical themes in the history and the spread of this art in the West. More importantly, it has also suggested some important themes to consider when discussing the emergence of Kung Fu and the continued popularity of the Chinese martial arts. Lastly we have seen that even in a era dominated by visual media, print sources continue to offer a valuable and nuanced window onto popular culture trends. Simply to fill in some blanks on the book Kung Fu for Young People, by Douglas Lee and Russel Kozuki. 1. The demonstrations in the book were randomly selected by Lee Moy Shan (LMS) to point out the differences between karate and Wing Chun, 1 step vs 3 steps. He wanted a good cross cut of scenarios, it is not necessarily a how to guide, but a comparison focused on the defensive aspects. 2. LMS had received his black belt from Kozuki and was teaching at Kozuki’s school with Moy Cheng Four (John Cheng), who is on the front cover and who also taught at Kozuki’s school. The lady on the cover was a model more than a Wing Chuner. Kozuki was fascinated by what LMS showed him in regards to WC and wanted to participate and help with the book and hence, is the coauthor. He had no input other than he wanted to show he was tolerant and acceptable of other forms of MA. 3 The back of the book is obviously a Sterling Publishers sales pitch. 4. The book was written by LMS and he partnered with Moy Yat in the effort, Kozuki had nothing to do with content. 6. Power Karate by Russell Kozuki features LMS on the front cover. 7. Prior to studying with Russell Kozuki, LMS was a Southern Mantis Sifu teaching out of the Jerome Mackey Studios in NYC. LMS Praying Mantis sifu was GM Gin Foon Mark, they worked together in the same restaurant in Chinatown. Anyone old enough from the NYC area will recall a black and white commercial in the late sixties of a Chinese guy doing praying mantis moves for Jerome Mackey Studios, that was LMS. Thanks for stopping by, filling in the gaps and providing a much richer window onto that volumes history!